While trying to learn more about women’s roles in brass ensembles, I stumbled across the research of Dr. Jill M. Sullivan from Arizona State University. She began her research about ten years ago, and she has definitely brought to light the importance and prominance of all women bands. The popularity of such bands spanned from 1870-1970, many of which were military bands formed during WWII as a result of the formation of women’s military organizations. 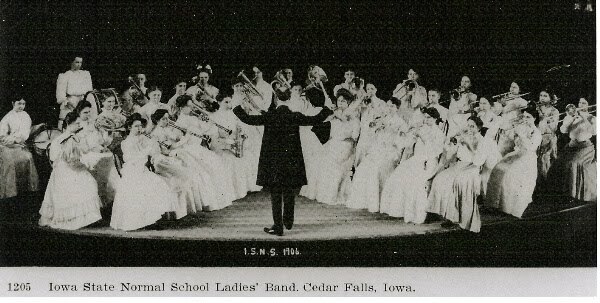 Other popular all women bands were family bands, town bands, professional touring bands, suffrage bands, high school bands, normal school bands, university bands, and immigrant bands. I was really surprised that Iowa seemed to be the home of many of these bands. All branches of the military had women’s bands. The first activated was in 1942 at the WAAC Training Center in Fort Des Moines, Iowa. Also, the WAC had the only female black band in the history of the United States military, the 404th, located at Fort Des Moines. Dr. Sullivan,Thanks for the link! I really appreciate all of the research that you are doing, and I look forward to following your research in the future. I will definitely promote your new book on my blog– congrats on your publication!